Review Summary: Thirty minutes of unadulterated chaos. A deathly silence fills the air until one faint, chilling note slowly becomes audible. As it swells and engulfs the listener, a few muted rumblings can now be heard underneath. These too grow in volume, and become something like a thick buzz. Suddenly, it all explodes. Psychotic guitars dance a chilling pattern on the listener's spine as drums disjointedly smash in a chaotic frenzy and the thunderous bass rings deafeningly. Out of nowhere, the voice of a banshee shrieks, this blood-curdling yelp piercing the listener’s body. For almost thirty minutes, the disorderly hysteria persists, until an ominous wall of decaying, discordant distortion replaces the outburst and slowly deteriorates into nothingness. 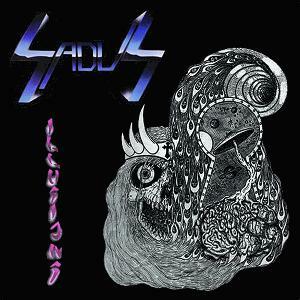 This cathartic discharge is Sadus’ debut, Illusions. The album is, first and foremost, chaotic and unstable. The riffs fly by at lightning speed, and the band changes the very essence of their music on a dime, with foreboding melodies turning abruptly into desperate, tremolo-picked riffs, which unexpectedly become wailing solos. Consequentially, the music is never linear, which, along with the unpredictability and lack of clearly-defined structure in most of the riffs, makes it so that the listener can barely keep up with everything going on around them. While the album is chaotic, however, it never becomes unfocused, as the music always feels like it serves a purpose and the songs all have a direction. What makes Illusions even more unique is the performance, as the musicians have a very unconventional approach that makes Illusions seem like an anomaly among other thrash records. Of particular note is Steve DiGiorgio, whose fingered, fretless bass is able to reach inhuman speeds, while still maintaining a deep, powerful tone, and vocalist Darren Travis, whose impossibly high-pitched screams sound like those of a man being tortured (this is especially visible on the song titled, appropriately enough, Torture). Truth be told, there aren’t really very many albums like Illusions. Even it’s successor, Swallowed In Black, while in some ways superior, couldn’t capture the absolute disarray and agitation of Sadus’ debut. As it stands, anyone that in any way, shape, or form enjoys thrash metal owes it to themselves to listen to this. This needed a review. Short write up, but I feel that it gets the point across. Working on Jethro Tull's catfish rising, nearing completion. It shall probably be up on Tuesday. Might do the Sadus discography, these guys are good. Cool review. Sounds like something I might like. Thanks, Phlebas! You gave Destroy Erase Improve and Rust In Peace 4.5's, so there's a big chance that you'd enjoy this. Kudos for reviewing this man. "Sadus. Sadus, Sadus, Sadus. This band really makes me sad, it really is the best example I've ever seen of squandered potential. Maybe this band just wants to make straightforward one-note thrash with nothing unique about it, but the musicians here are cut out for something better. They STARTED getting better the later they went on as they lost more of the one-note-ness, but even in their best release "Elements of Anger", the music is still too bland. This is the worst offender, the most one-note, the most bland, the most lifeless (lifeless used in a different way(you know what I mean)), the most uninspired thrash album I've ever heard." Love this album... Nice review. Added Certain Death. SA is awesome, but not good enough to be a highlight, imo. It's pretty close to a 5 for me, definitely one of my favorite thrash albums. as you will be familiar with.